High on Fire FINALLY announces a tour in support of their latest album De Vermis Mysteriis. The Oakland Stoner Metal band will kick off the tour in Austin, TX on November 22nd and will end on December 22nd in San Francisco, CA. 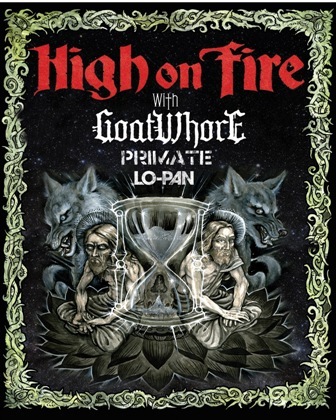 Goatwhore and Lo Pan will be coming along for the ride along with special guests Primate (featuring Mastodon's Bill Kelliher and Kevin Sharp of Brutal Truth) joining them from November 23 to December 1st. Heavy metal legends Corrosion of Conformity will also be supporting the tour during the December 18-21 dates.